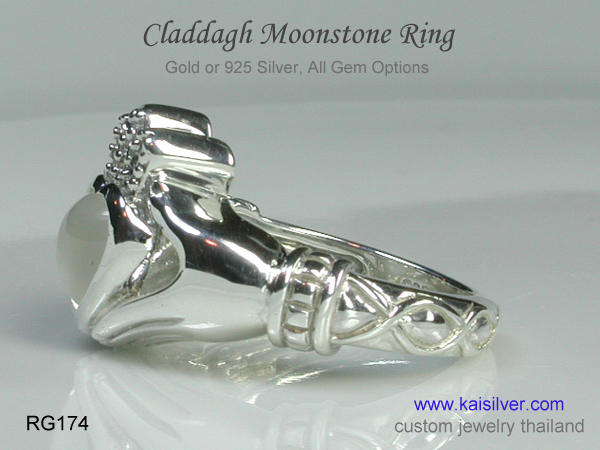 Kaisilver presents the historic cladagh ring with one of the most mystical gemstones of all time, the moonstone. The first cladagh ring was made by a humble Irish fisherman turned slave, this was around four centuries ago. The Kaisilver cladagh ring is based on a thorough research into the history and tradition of this famous ring. Our rings are today acclaimed to be the finest rendition of the jewel and retain, all the essential features of the first ring made centuries ago. You can order a gold or 925 silver moonstone cladagh ring, we maintain the same quality standards for the gold and silver rings. Observe the features of the ring and you will notice the heart shaped center, a crown on the heart and two hands stretched out to hold the heart. Since each moonstone cladagh ring is fully custom made, we can accommodate all design modifications but, do read the information on this page before requesting any modifications. The moonstone with its almost mysterious shimmer is one of the most intriguing gemstones, provided to us by mother nature. The ancient belief was that moonstone was formed from frozen moonlight, people therefore believed that the shimmer on the gem reflected the phases of the moon. Hold a piece of cut and polished moonstone in your hand, look at it from different angles and the shimmer or glow in the stone seems to float around. Moonstone comes in a few colors but, it is white moonstone that best showcases the fluid look of the stone. 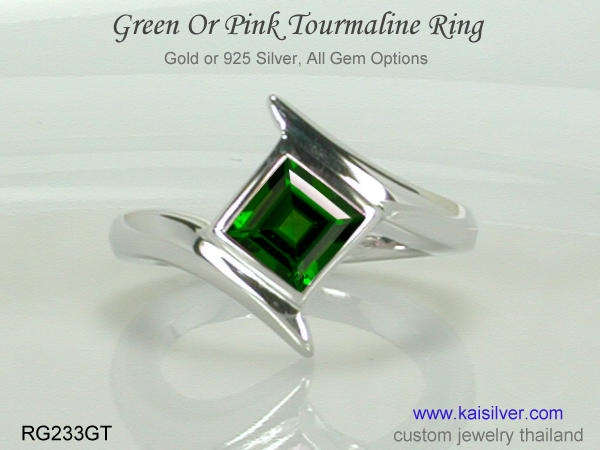 Kaisilver cladagh rings retain all the essential features of the centuries old jewel. Equal quality standards are maintained for the 925 silver and gold moonstone cladagh ring. Each ring is fully custom made, all ring size requests can be accommodated. The moonstone claddagh gold ring can be ordered in 14k or 18k gold. (10k pricing on request). When ordering the gold moonstone ring, select yellow, white or rose gold. 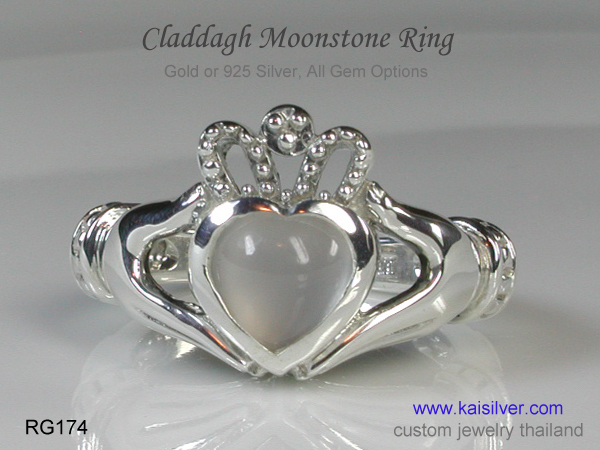 Plating options are available for the 925 silver claddagh moonstone ring. No plating done on silver will last permanently, it will peel off with time. The center gemstone is a 7-8mm custom cut natural moonstone. The ring is built to last with a metal weight of around 8 to 10 grams. You can also request for the option to set 3 diamonds in the crown. 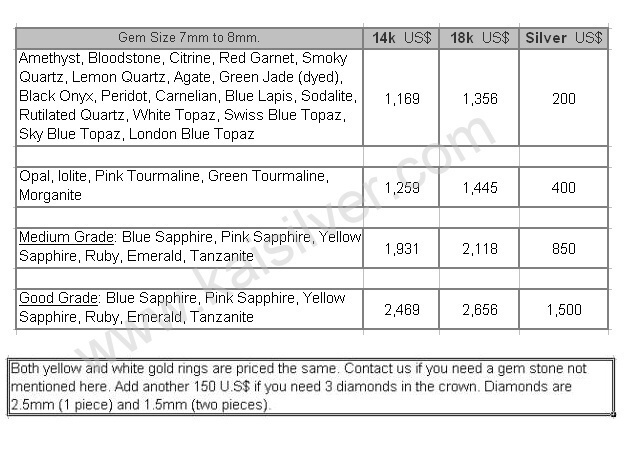 The diamonds (optional) are 2.5mm (1 pc) and 1.5mm (2 pcs). A small message, date or name can be etched inside the ring at no extra charge. We provided all gemstone options for the gold or 925 silver claddagh ring. You could wear your moonstone cladagh ring to work every day or keep it for a special occasion. Since both metal options get the same superior standards related to craftsmanship and gemstone, there is really no need to differentiate the jewel as a formal or informal wear jewel. 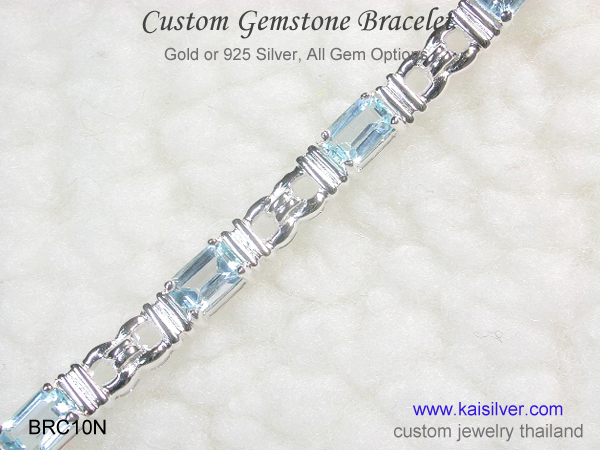 At Kaisilver we custom cut every gem that is set in the jewelry crafted by us, this is all the more important when it comes to moonstone. The gorgeous glow seen in the stone is an amazing optical phenomenon. When you look at a piece of rough moonstone before it is cut and polished, the stone gives no clue of its beauty. Expert gem cutters need to perfectly orient the piece of rough before making the first cut, critical calculations need to be made regarding the shape, size and thickness of the final piece. Claddagh Ring Meaning: Some jewels are pretty others are worn for their significance or meaning. The Kaisilver claddagh ring with its fine workmanship and custom cut gemstones is simply gorgeous. But as you might know, the claddagh ring is widely acclaimed as the most meaningful jewel in history. The first cladagh ring was made by an Irish slave named Robert Joyce, the young man made it to showcase his love for his beloved. The heart symbolized love, the crown signified loyalty and the hands were stretched out in friendship. The meaning of the ring is relevant even today, the love depicted in the jewel need not always relate to a matrimonial relationship. A daughter could gift her mother a claddagh ring, a young man could gift it to his wife-to-be. How To Buy: A hurried 'click and buy' approach is surely not the right way to shop for fine custom made jewelry. We will advise you to discuss your requirements with our experts at sales@kaisilver.com Get all your queries answered, we are not in a hurry for you to close the discussion and make a purchase. Once you have all the information you need, move to the order confirmation phase. We accept payments through Paypal and Western Union but, recommend Paypal for first time users. You can let us know which mode of payment suits you and we will provide details for the same. Each claddagh ring is completely custom made, highly skilled artisans work on each jewel. Production is 4 to 6 weeks from the date of order confirmation and receipt of payment. We will ship through FEDEX with web tracking, you will receive the tracking number the moment the item ships.